Discussion in '2020 Recruiting Profiles' started by Jared Grubbs, Mar 3, 2018. 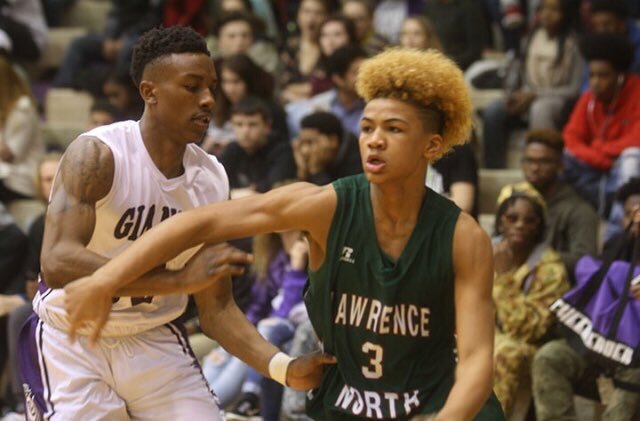 2020 Point Guard - 5'11"
Butler is showing interest in Mike Saunders Jr. of Lawrence North and G3 Rising Stars. Undersized 2020 PG who has offers from a handful of mid majors + DePaul (enter DePaul joke here). That’s who they were watching yesterday. ButlerHomer and ButlerBoyz like this. I’m watching Meanstreets vs G3 Grind right now. Mike Saunders is getting Butler interest I know. He just entered the game. Just had a very impressive drive, hang, and finish through contact at the rim. Hunter Jackson for G3 has a DePaul offer. So does Destin Whitaker of Meanstreets. Both had buckets early. Jackson buried a 3 pointer and then got to the rim off dribble penetration. Whitaker scored on a very smooth pull up jumper in traffic. What yr and position is Mike Saunders? 2020 PG. He lightning quick and has handles to match it. He has good anticipation guarding the ball and has been an absolute best on D. He’s looked like Aaron Thompson in this one with his ability to beat ball handlers to the spot. BHayden and cornette33 like this. Saunders off to another great start here in the opening round of bracket play. He’s got 9 points midway through the first half (1-3 on FTs though). Defensively on the ball he has probably flat cut off half a dozen drives as well. His quickness and anticipation is elite level. 247 sports has him listed as 5’6”. He is absolutely not 5’6” or anywhere close. The media guide has him listed at 6’0”. That might be typical exaggeration that you see with everyone, but it’s much closer. I wouldn’t be surprised if he is actually 5’10”, but the point is that his size is not going to keep him from playing in the Big East. I don’t know where 247 gets 5’6” from. I’ve looked over at the adjacent court during timeouts and twice I’ve seen Saunders get to the rim and finish. G3 is beating Ohio Red by 4. Indiana Elite is destroying Mac Irvin. There are going to be some more great matchups here in the semifinals and finals. I just copied over a bunch of posts from the Run N Slam thread. Saunders definitely made me a fan of his this weekend. I think the thing that impressed me the most was his defense. His ability to jump driving lanes and cut off dribble penetration is elite. Better yet he does it all without reaching. He slides his feet and shows his hands, and then only if the defender puts the ball in front of him does he reach in for the steal. He needs some work away from the ball, where he plays much more passively (he passed up several chances to take charges), but his on the ball defense may have been the best of anyone all weekend. Offensively he is a good ball handler and can go anywhere he wants on the floor. I was extremely surprised with his ability to absorb contact and finish at the rim. He is much craftier there than one would think. He knocked down multiple pull up jump shots, but I'm not really convinced he's a good shooter. I'll need a larger sample size but my guess is perimeter shooting is the biggest area of his game that he needs to improve. Still, Butler could really use a quick point guard like Saunders who can break down defenses down off the dribble. I'd be happy to see them pursue Saunders further. Since the contact restrictions have lifted Saunders has heard from Nebraska, Northern Illinois, Temple, Iowa, Marquette, East Carolina, IUPUI, Ball St, Northern Kentucky, Miami Ohio, Loyola, Morehead St, Valpo, UT Martin, UT Chatanooga, and Depaul. Wright State and Cleveland State have recently called and offered. Saunders team won the 16U Under Armour circuit. He was named 1st team All UAA. Everyone else on the 5 man team has high major offers already. For perspective, he beat out Zeb Jackson for 1st team, who is one of the most sought after PGs in the country (rightfully so) and also holds a Butler offer. I think he is one of the most underrated players in the country and I’m shocked he has no high major offers of any type yet. I don’t think he’s as good as the Caleb Love or Zeb Jackson types, and that’s who Butler is pursuing right now (Jackson is criminally underrated at 88, he’s a top 50 guy in my book). So I’m not questioning Butler for not offering, but I do really like Saunders. His quickness is outstanding and he has Aaron Thompson level anticipation guarding the ball. I hope he’s still available if Butler’s initial pursuits don’t plan out. BHayden and ButlerNut like this.